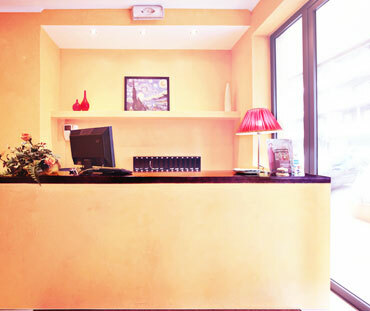 The Hotel Airport Florence enjoys a favorable location near the Airport of Florence, just 1.5 kilometers away. Travelers will enjoy the peace and quiet of our hotel in the Novoli residential district, a relaxing break from some of the hustle and tussle of city life. Our hotel in Florence enjoys a cozy location in the quiet residential district of Novoli, with the hotel not being far from the city centre and can easily be reached by public transportation or by taxi. By Train:Travelers arriving by train can take bus number 29 or 30 from in front of the station. Take the bus for about four kilometers getting off at the Petri – Golden Tulip Mirage Stop. The business hotel in Firenze is a 1 minute walk away at Via Don Lorenzo Perosi no. 39. Taxi services are also available from the train station. By air:Our hotel near the airport in Florence is just a 15 minute walk from the airport, just head south towards the city centre. Or take a short taxi ride to get to Hotel Airport Florence on Via Don Lorenzo Perosi no. 39, not costing more than 10 Euros. By car: Guests arriving by car can take the A1 Motorway to the North Florence exit, getting off and heading in the direction of the city centre for about 6 kilometers until reaching Hotel Airport Firenze, just past the airport on the right at Via Don Lorenzo Perosi no. 39..
We have included a map of where our accommodation is situated below complete with directions so you can see exactly where we are. Florence is loaded with a rich artistic culture and history and offers some of the most beautiful monuments and buildings Italy has to offer. Only a short ride away by public bus, guests can find themselves immersed in the historic centre wandering among some of the most breathtaking architecture in Italy. Breaking the skyline is the awe inspiring Cathedral of Santa Maria dei Fiori, a UNESCO World Heritage Site and one of the largest basilicas in all of Italy. Easily recognizable by the largest brick dome ever constructed, it’s a major tourist attraction to all visitors of Florence. Faced with marble panels in various shades of green, pink and white, it’s a must see for any visitor to the city.